I recently attended my first women’s retreat just outside Saskatoon, SK. It was a wonderful getaway filled with crafting, laughing and connecting. I have never spent that kind of time with a large group of women before and I was blown away by the similarities between all of us despite all our many differences: when asked “who are you?” 17 out of the 19 women started with “I’m a mother of (number of children), (name) is (age) and (name) is almost (age).” The second similarity I found was this: every single one of them could name 4+ flaws about themselves but yet, they struggled to name one positive thing that made them special. The third similarity I discovered was that they all loved so deeply but were almost cursed by it because they felt either taken advantage of, felt guilty for taking personal time or felt it wasn’t reciprocated the way they wanted. The fourth, and maybe saddest, similarity was each women’s confusion when asked what made her happy. I started calling these similarities "the curse of woman". Over 98% of us identified ourselves as mothers first. We all felt lost trying to find a special quality and we were quick to berate ourselves. Most of us saw our loving nature as both special and flawed. Few of us could remember what made us happy. If that many women felt that way in that small room, there must be more of us. Think of how many people you know whose entire existence revolves around motherhood. I’d bet she feels guilty for doing things for herself. I’d also bet that she gives and gives and gives and has a cup that seems to always be dry. I bet she’s exhausted but happy to dote on her children. I bet she doesn’t spend much time away from them. She probably feels guilty for leaving them with Dad or Grandma or a babysitter. I bet she doesn’t know what makes her happy anymore because she’s been trying to help her kids find theirs. I bet she feels happy that they are happy but utterly lost when she takes a small, fleeting moment to contemplate her own. This is the curse of woman. As mothers we have the most important role in life. It’s our job to keep them alive, fed, clothed, hydrated, healthy and clean. We ensure they use their manners, do their homework and try at least one sport a year. We kiss them, cuddle them, tickle them and sometimes want to throttle them. We are trying to teach them how to be functional members of society while also fostering their innocent wildness so they become the unique individuals they are destined to be. We are the teacher, the moderator, the voice of reason, the judge, the boss, the discipliner, the nurturer, the driver, the coach, the rememberer, the confidant. It is exhausting. But want to know what’s more exhausting? Trying to do all that on the fumes of the person you used to be. This mom guilt over self-care needs to end now. We are no good to anybody if we haven’t had a decent night’s sleep in months or haven’t had a shower in a week. You need energy and vitality and, even more than those, you need a life you don't want to escape from. I don’t berate mothers for putting their role as mothers first. It’s important and special and wonderful. For some women, it becomes more than a role. Motherhood is their life. Motherhood is their identity and reason for living. That’s a beautiful sentiment and belief. BUT, is she also making time for herself, as a women, as an individual or even as a wife? Is she setting a good example for her kids if she’s frazzled and unkempt and not doing anything outside of motherhood to benefit herself? You can't fill another's cup if your own isn't overflowing with energy, love and self-respect. Honour your body. Love yourself. Mothers need it most. Also, the flaws! Goodness, the flaws these women see in themselves is bonkers! When asked what made them special, many floundered and couldn’t come up with anything to say confidently or with surety. But when asked what their Darkness was, they had lists. Is it human nature to do this? Is it societal influence that’s molded us into belittling ourselves? Has some collective unconscious shift happened that makes us focus on our Darkness instead of our Light? It seems we all do it. And those that don’t get judged as conceited or arrogant or self-absorbed. It’s a lose-lose, really. When prompted to acknowledge their special attributes, many said their ability to love. Is the influence from motherhood or the Divine Feminine running through our blood that makes so many of us love so fiercely? We love our partner and our children and our families and friends and pets so hard that sometimes we look at the actions we’ve taken in the name of love and wonder, was it worth it? Was giving my all in that unreciprocated friendship worth all that time? Or did it benefit me to lose half of myself in that man? Did dedicating myself so fully to motherhood for so long leave me bereft of pieces of the person I use to be? Which leads to the last similarity: few women could confidently list what makes them happy. It’s understandable when you’re so busy raising children; Who has time to focus on what makes them happy? Even when we know, we feel guilty for indulging in it. It’s a common story for moms who spend so many of their hours dedicated to their family. We spend a lot of time putting others first. Actually, it may be fair to say we spend all of our time putting others first. What is happiness on a personal level when you’re wanting your kids to be happy and maybe also your husband, pet, co-workers, boss, friends and/or neighbours?! These curses all tie together. Does that resonate with you? It sure does for me! I used to feel guilty for wanting alone time. I used to feel guilty for spending money on myself. 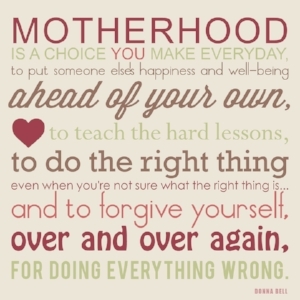 I feel like motherhood has given me so many blessings but has taken a lot from me. My freedom is gone, my carefree lifestyle is gone. My independence is gone. I obviously wouldn’t trade it for the world but there’s this dark side to motherhood we rarely discuss openly, let alone on a public forum like this! I’ve spent so much time focusing on my husband and his business, my daughter and her upbringing, our new house and maintenance, my business and its success that sometimes when I stop and reflect, I’ll think, “Kelsey, are you still in there? What can I do today to love you?” Lately, I've been committing to small steps that lead towards my best life. I'm cooking for pleasure more. I read more books and do yoga in the living room where my daughter can see me. Sometimes I just like to scroll social media and watch Instagram stories. The guilt will attempt to weasel its way in but I can quickly squash it because I know that it’s important that I make time for myself now. Self-care is more than escaping the chaos. Self-care is doing little actions that have big benefits, specifically long term. My dream life requires a lot of work so self-care is a priority. So my mornings consist of exercise, yoga, journalling, working on my business, planning blog posts, cleaning my house and/or snuggles with my daughter. My family knows when I’ve been putting my self-care on the back burner; it shows. So I also make conscious efforts to spend time with myself. From bubble baths to daytime naps to having a hot cup of coffee before the rest of the house wakes, I am loving myself by filling my cup as best as I can. My advice, despite my lack of expertise: take more bubble baths. Find a monthly women’s circle. Massage your own feet. Read ten pages of a book each night before bed. Walk in the forest. Show your kids how amazing life is. Make time for yourself. It’s allowed. Hell, it’s welcomed! There should be zero guilt when you are teaching your kids the importance of loving yourself. Lead by example and the kids will thrive in their own journeys towards self-fulfillment, self-love, success and self-care. So it’s time to break the curse of woman. It’s time to love yourself like you are your most sacred, most beautiful best friend in the entire world. You need to love her like she deserves to be loved. You need to be able to confidently and loudly say, “THIS is why I’m special. And this is too. And that too. I am all kinds of unique and awesomeness.” The time has also come to accept our Darkness. You can’t have Light without Dark, nor Dark without Light. We are imperfect beings. We always will be. Trying to shine Light and illuminate every single little flaw will only drive you crazy with self-loathing and be a waste of your time. So own your flaws. The people who love you know them and accept you for them regardless. More often than not, your good qualities will far outweigh the bad. If they don’t, well, that’s another post! It’s also time to welcome acts of self-care into your world. Motherhood is hard; motherhood is harder when you’re running on empty. Ignore the guilt that tries to encroach upon you and see the benefits to everyone around you when you fill your cup. Your filled cup is what paves the way for an incredibly full and vibrant life for many around you, especially your children. Self-care shows them the importance of doing the crappy little jobs that lead to big rewards later (like saving 10% of each pay cheque or getting up at 6 am everyday)! It teaches them the value of honouring your body. It's teaching by example how incredible life can be when you work towards the things you want and desire. It's so much more than bubble baths and chocolate -- although, both are wonderful! The time for the Woman to rise has come. It’s time we rise up to meet our full potential and embrace the dirty, messy, glorious, wonderfulness that is Her. Mothers are the most special creatures on Earth; they deserve the bubble baths and girl's nights out and make-out sessions and sleep-ins and yoga memberships. So rise, Woman. Be the divine, loving, happy woman who shines so brightly, others want to know her and are inspired by her. Be your best self. Do it for your family, your community and more importantly, do it for yourself.